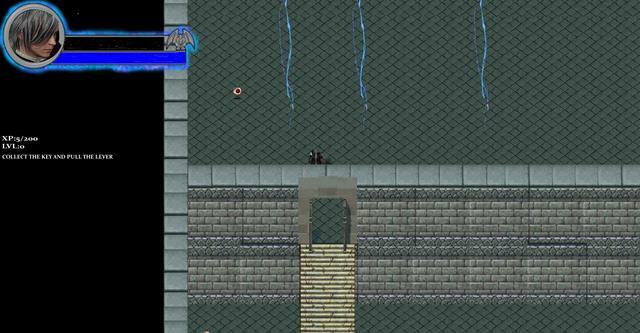 A.D.M (Angels,Demons And Men) - Angels, Demons And Men(A.D.M) is an apocalyptic hack n slash RPG. Join and win! 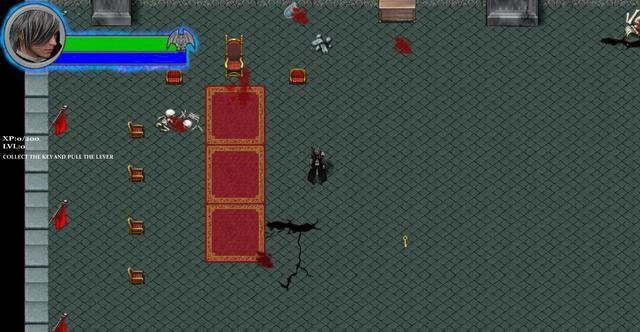 Angels, Demons And Men(A.D.M) is an apocalyptic hack n slash RPG. Explore the worlds. 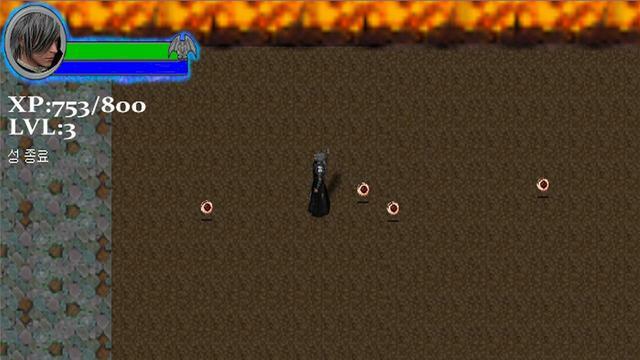 Master combat skills and learn god-like spells, slay various demons and prepare to save the world. The game is available for $12.99, but the winners of our contest will get it for free. The developer gave me a key which I found earlier this morning (Saturday 8th Sept). I've spent well over 4 to 5 hours playing the game, but due to the games difficulty level, I failed to even complete the first few objectives, i.e. collect a key and pull a lever. I found the key quickly, then spent the next four + hours repeatedly dying and still haven't found the lever. I will continue to play the game and update this review as time permits over the coming days. I feel duty bound because of the free key, but I do think there are some serious flaws and omissions; or at least, some serious updates need to be released before I could enjoy playing this game. It's been released on Steam for less than a month and as yet there is no community feedback, and I've found no gameplay information online and only two videos. At this point in time, I'm really not sure if I like the game. RPG's are my favorite genre (for example, over the last few years I've played the Elder Scrolls Online for over 5000 hours, at least the same amount on other Elder Scrolls games such as Morrowind, Oblivion and Skyrim and an equal amount of time on the later Fallout series (3, New Vegas and 4). I've been playing RPG's in various formats for almost 30 years (my first one was called Darklands) and cannot ever remember struggling so much at the beginning of a game like I have done with A.D.M (Angels,Demons And Men). 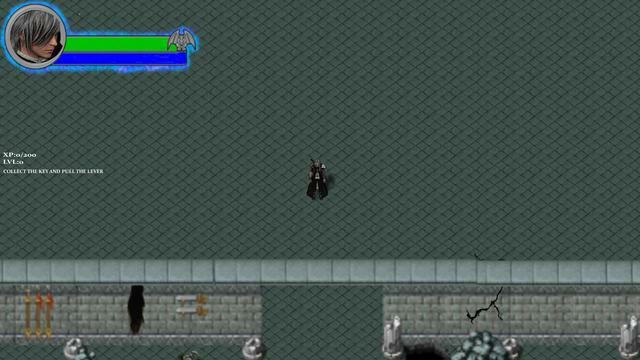 A.D.M (Angels,Demons And Men) is a difficult single player dark fantasy RPG with perma death and 2D graphics in the tradotion of the old school cRPG’s of the 1990’s for example Baldurs Gate, Planescape: Torment, Arcanum: Of Steamworks and Magick Obscura, and even the early Fallout games. However, I don't think the graphics are as good. The game uses the Unity Engine. As with all RPG's you level up through experience and like most fantasy RPG's have access to wide range of magical abilities and weapons, for example, Swift Blade, Bats Attack, Luminous Shield and Fireball to name just a few. If you've previously won a key for other Steam key giveaways recently and still not received your key, please contact the giveaway team via the contact form HERE. 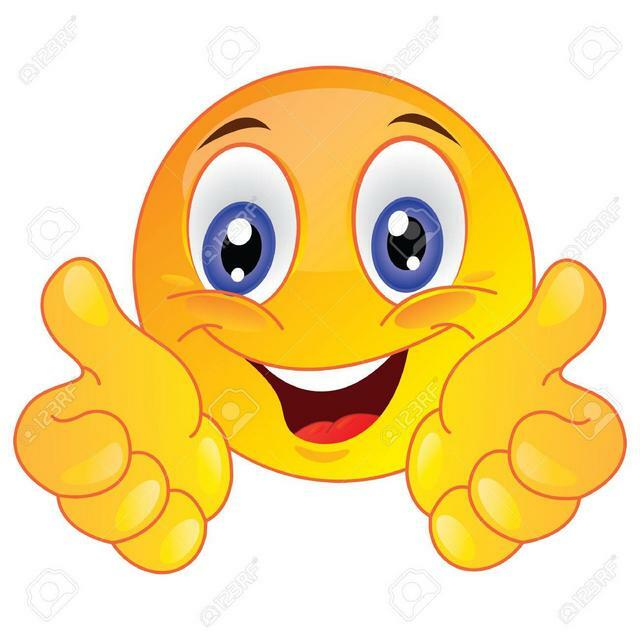 Please include details of the name and the email you used when you entered the competition, plus a screenshot of your name in the winners list would be useful to confirm your win, thank you. 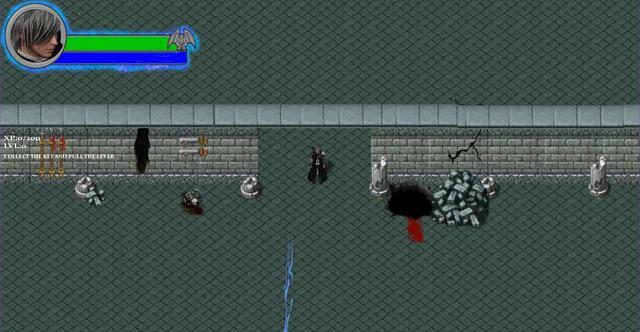 Angels,Demons And Men (A.D.M) is a story-driven, hack n slash RPG.A void earth draws near.Ancient demons awaken.Darkness creeps in from the shadows. Stand up your weapons and defend the earth in mankind in his final days. Become a royal knight, student mage or a lost angel. 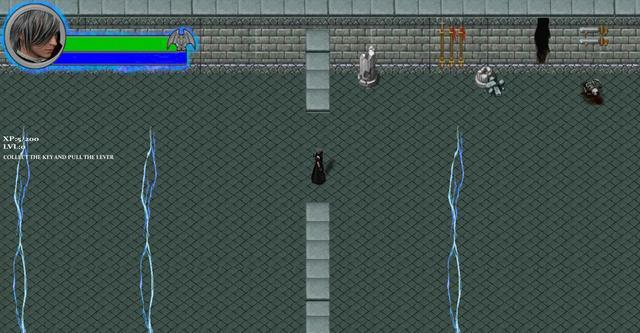 Explore various locations and slash enemies in tough combat. Experience the story. Gather xp points, magic items and rise in strength level. In order to save her dying lover; Aya,a witch of the order of nine covens cracked a seal on the gates of hell. Accidentally she released cade and his demons from their prison.Now the earth must stand together to survive this new threat. Reference accessed HERE 8th Sept 2018. Then create a Steam profile/account. Once that has been completed you can input the Steam code that you've received (after completing the form filling) via the game button along the top of the Steam client, (located between friends and Help). From the drop-down menu select 'Activate a product on Steam'. This opens a product activation window. Just follow the prompts to complete activation. Once the Steam code has been accepted, the game will be associated with your Steam account and can be installed any time you wish. Once the game is officially released, the beta will no longer be accessible (as far as I know). 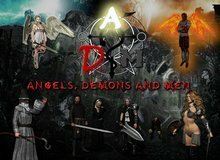 If you have a problem installing or activating or getting A.D.M (Angels, Demons And Men) to work, please visit the problems section over in the Game Discussion forums, which I've now incorporated into the FAQ's thread, and which you can find HERE or check the Steam forums or contact Steam support. In order to save her dying lover, Mya, a witch of the order of nine covens cracked a seal on the gate of hell to steal its power. Accidentally, Cade and his demons were freed from hell. Now the earth must stand together in order to survive and defeat this new threat. There’s also an extra's, continue and quit buttons. Clicking on Story Mode will start a new game. 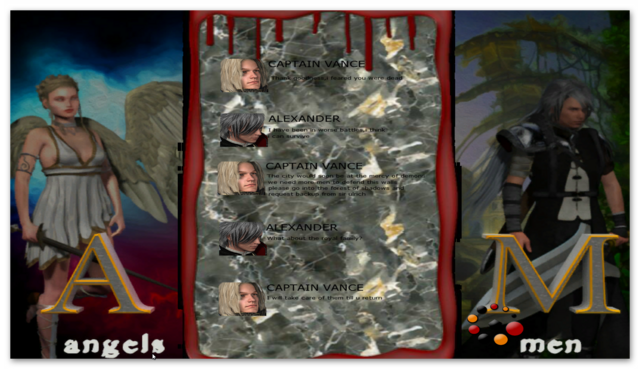 Once the intro story is finished a story board opens up with written dialogue between two characters Captain Vance and Alexander. (See the image ....). The start of the game involves you finding a key. If you walk westwards along the wall for about 20 seconds, then move diagonally in a NW direction you should hit the golden key head on. 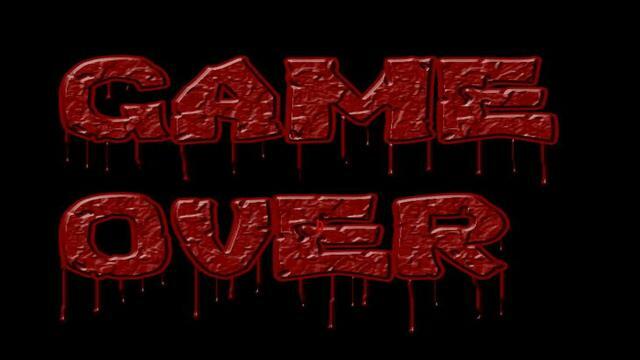 If you start by going NE you'll encounter the top of a cliff with what appears to be lava at the bottom; the game assumes you've fallen in and died, so you get a splash screen saying Game Over. Control of your character is by using the WASD keys. I found movement frustratingly slow. Once you recover the key, you have to pull a lever. I’ve already spent over 3 hours trying to find the lever. And have only managed once to get to a fourth area, where I presume the lever can be found, but died constantly. I haven’t found a save progress button and although there is a continue button, I’ve not progressed far enough for an auto save to kick in. You can also select from several options to either run the game fast, which is great for older low-end computers or with the best graphics. The choices you get are Fastest, Fast, Simple, Good, Beautiful and Fantastic. 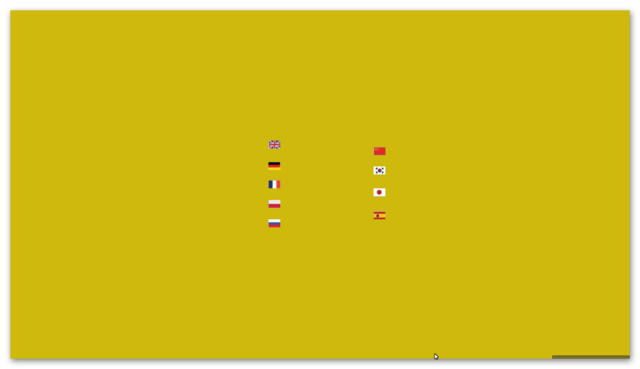 There are no screen resolution options, but when in windowed mode you can change the size of the window by dragging the top left corner of the window to make it larger or smaller and you can return to full screen mode by the usual windowed method, i.e. pressing the button in between minimized and close window. 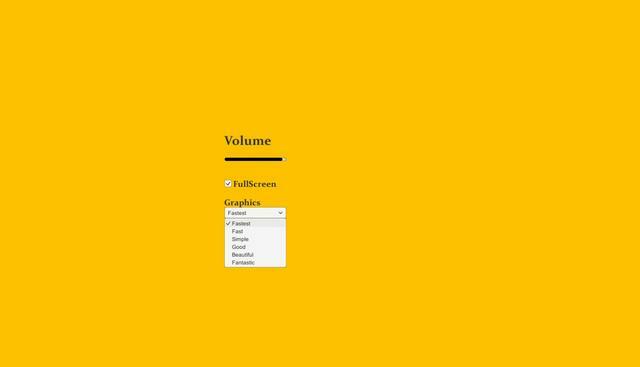 The default window size is around 1920 x 1080. The help button gives you access to the key bindings for three different characters, i.e. Angels, Demons and Men. 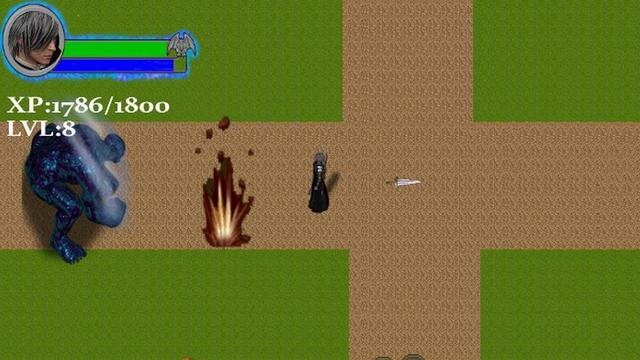 Both the Angel and Man have four different magical abilities which are accessed via the keyboard, I = Shield level 3, O = Swift Blade (level 4), K = Sword Rains (level 6) & L = Blade Traps (level 1) for man, with an attack button ], the angel uses O= Holy Sword (level 5), J = Nature’s Orb (level 1), K = Call of Nature (level 8) and L = Luminous Shield (level 1) with attack button I. 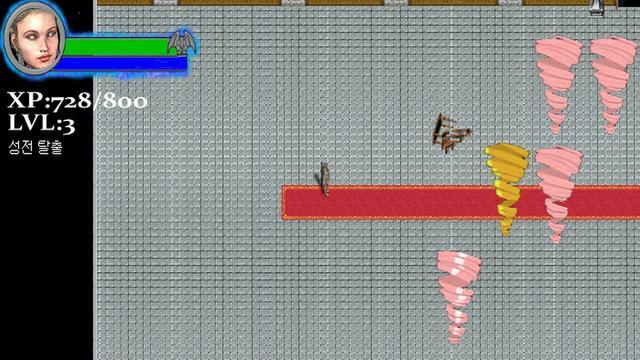 Finally, the demon has five abilities using the keys I = Iceball (level 1), O = Fireball (level 1), J = Call of the Dead (level 6), K = Bats Attack (level3) & L = Lightning Strike (level 8). You can see all the spells, the amount of Mana they require and the levels they are unlocked in the image below. None of the key bindings appear to have an option to change. All the abilities require Mana to use; the higher the level the ability is, the more Mana (usually) is required to use it. 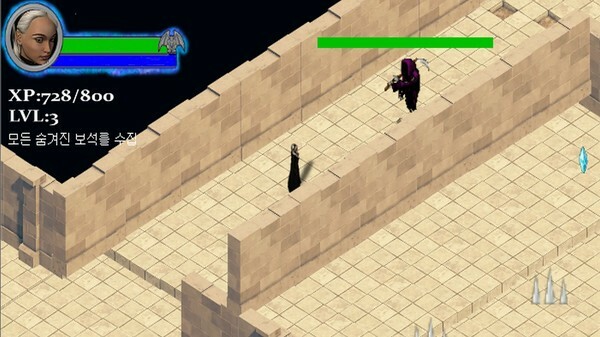 Your characters health and Mana are indicated in the top left of the screen next to your avatar. The top green bar is your health bar and the blue lower bar represents the amount of Mana you have. The help button gives you access to the key bindings for three different characters, i.e. Angels, Demons and Men. Both the Angel and Man have four different magical abilities which are accessed via the keyboard, I = Shield level 3, O = Swift Blade (level 4), K= Sword Rains (level 6) & L= Blade Traps (level 1) for man, with an attack button ], the angel uses O= Holy Sword (level 5), J= Nature’s Orb (level 1), K= Call of Nature (level 8) and L= Luminous Shield (level 1) with attack button I. 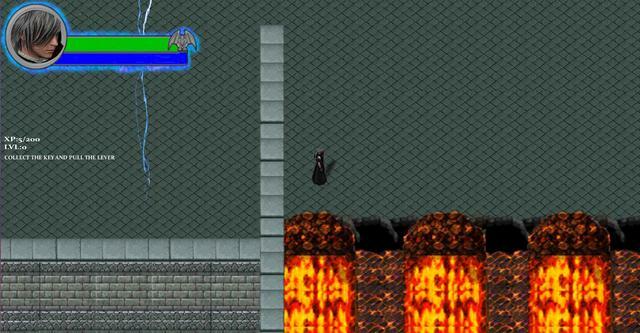 Finally, the demon has five abilities using the keys I= Iceball (level 1), O= Fireball (level 1), J= Call of the Dead (level 6), K= Bats Attack (level3) & L= Lightning Strike (level 8). You can see all the spells, the amount of Mana they require and the levels they are unlocked in the image below. None of the key bindings appear to have an option to change. All the abilities require Mana to use; the higher the level the ability is, the more Mana (usually) is required to use it. Your characters health and Mana are indicated in the top left of the screen next to your avatar. The top green bar is your health bar and the blue lower bar represents the amount of Mana you have. I will add more to this review once I’ve had the opportunity to play some more. Posted by Whiterabbit-uk 8th Sept 2018. The following is only my initial thoughts on the game. I’ve not played the game long enough to discover much (just over 4 hours). I found the settings were always resetting to default when I died and would have to reset the graphics to Fantastic. At the start of the game, you only appear to have access to one character, i.e. the man and movement feels excruciatingly slow. The absence of a mini map also makes it difficult to see what you’ve already discovered. Mini maps were common in some of the RPG’s I played 20 years ago. I would suggest to the developer that they consider adding a speed up potion or increasing the default walking speed and adding a run option, that could be stamina led. 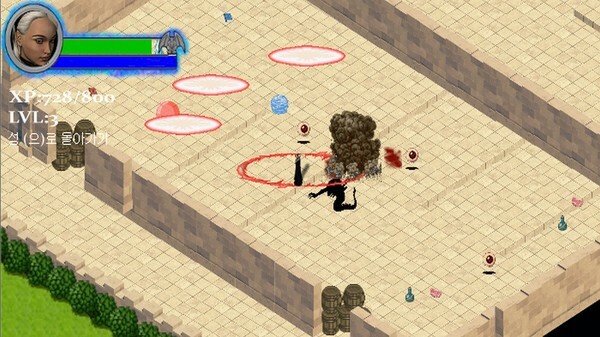 In most RPG’s of this style, you can usually see much more of the environment. The short distances you can see make it very difficult to choose the correct direction to move in without seemingly wasting a lot of time. After 4 hours of game play I still hadn’t discovered the whereabouts of the level I was supposed to pull after finding the key. I must have died about 60 or more times and became very frustrated. At this point on time, I’d not even encountered any significant enemies to fight. The only things I had the opportunity to kill were what appeared to be miniature floating eyes. 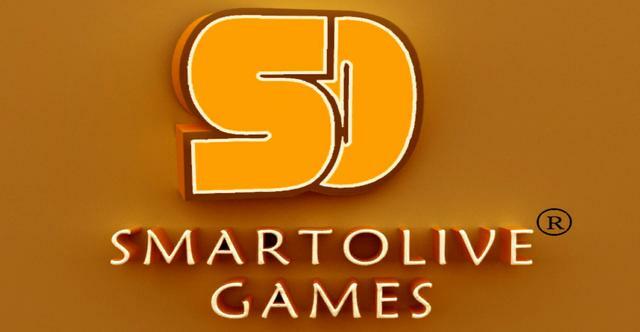 I'd like to take this opportunity to thank the developer Smart Olive Games for providing yet more keys for A.D.M (Angels,Demons And Men) and also to the game giveaway team, as always, for securing other ways to get free games. Let me know how to find that lever. I spent a couple of hours trying but never succeeded.